Generation A is set in the near future in a world where bees are extinct, until five unconnected people all around the world— in the United States, Canada, France, New Zealand, and Sri Lanka—are all stung. Their shared experience unites them in ways they never could have imagined. 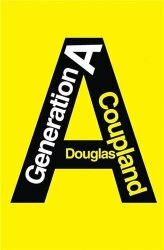 The clever conceit of a world without bees hints that Generation A could be a novel about environmental catastrophe, but Coupland is interested in a more subtle kind of dystopia.